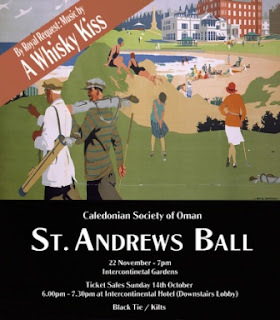 Coming up later this month is the annual St Andrews Ball held by the Caledonian Society of Oman. It's outside this year in the InterCon gardens on 22nd November at 7pm. Tickets are RO 55/60 depending on whether your a member of the sweaty jock club (that's the Caledonian Society of Oman). The band this year is A Whiskey Kiss, who recently performed at Prince Williams 30th birthday amongst other things. If your keen to go to the party, you can email for tickets or for more information, caledoniansocietyofoman@hotmail.co.uk or call Marjorie on 95632379.